Environmentally Friendly Washable Kraft Paper- A washable, extremely resilient and flexible material that looks like leather but is actually environmentally friendly paper. 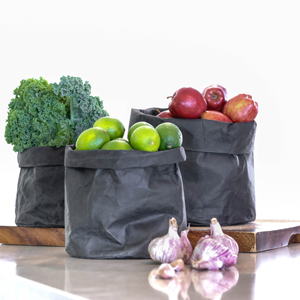 These environmentally friendly recyclable pot covers or tidy bags can be used for a whole range of different uses. A few ideas for their uses are: pot covers for your pot plants & herbs (cover is not waterproof—saucer or plastic liner can be used), fruit bowls, storage for make up, kids toys, or to just hold your nick-knacks.